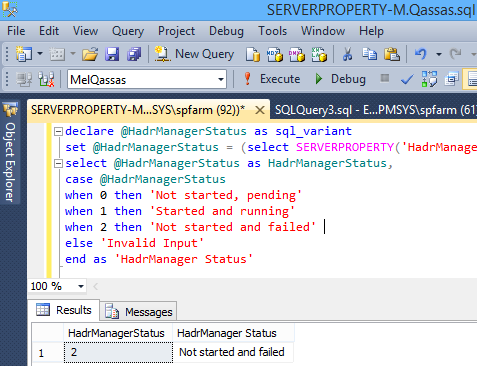 Check the "Always On" availability groups manager status using SERVERPROPERTY in SQL Server. In this blog, we will simply show how to check the "Always On" availability group manager's status using "SERVERPROPERTY". "SERVERPROPERTY" is a System-defined Function used to return the SQL Server instance information. Use HADRMANAGERSTATUS property to check the "Always On" availability of group manager's status. Check the "Always On" availability of group manager status using PowerShell? You can use Windows PowerShell to invoke the SQL command on a reachable server within the network using Invoke-Sqlcmd cmdlet as the following. Open Windows PowerShell as Administrator.